The 2014 Market Forecast published in May by the Measurement, Control & Automation Association (MCAA) provides a five year market forecast for Process Instrumentation & Automation (PI&A) equipment segmented by major process industries that shows the total US market value will grow to $13.6B ($1.3B in Canada) by 2018. The report, which has 80 pages of detail on 12 product categories, 12 industry segments and estimates for both the US and Canada, also includes a spotlight on the technology displacement of electronic vs. mechanical flowmeters and a spotlight on market developments in Mexico. In July, market analyst, Paul Rasmusson, President of Global Automation Research LLC, reviewed the highlights of the Forecast during a webinar for MCAA members and prospective members. During that webinar, Rasmusson noted, among other developments, the continuing investment by the Chemical industry in unconventional gas as a feedstock and the construction of fertilizer and ethylene plants which will make the US an exporter, for the first time, of these products instead of a heavy importer. Prepared annually for MCAA members jointly by the market research firms of Global Automation Research LLC and ReMap Sales Planning LLC, the Forecast predicts a 5 Year US CAGR of 4.2% with the Oil & Gas, Chemicals, Refining and Pharmaceutical industries projected as growing at above-average rates while Water & Wastewater, Electric Utilities, F&B, Cement and Mining will remain below average due to factors such as price pressure, cyclical downturns or overcapacity. Global Automation Research LLC notes that the Oil & Gas Industry which had record high spending in the 2012-13 period will have slow growth in the early part of the forecast period but will recover by the end. On the PI&A product side, the products with the best growth rates will be flow, level, control systems & remote I/O growing at above average rates. The report highlights that tank level gauging will grow at 9% per year over the forecast period, primarily because of increased construction of holding tanks at each end of the growing crude oil transport business. 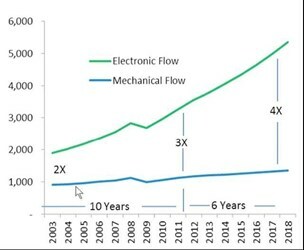 In its spotlight on the technology displacement of Mechanical Flowmeters by Electronic flowmeters, the report shows that the displacement has accelerated over the last 15 years such that the electronic flowmeter market which was 3 times the mechanical market in 2012 is forecast to be 4 times the size by 2018. 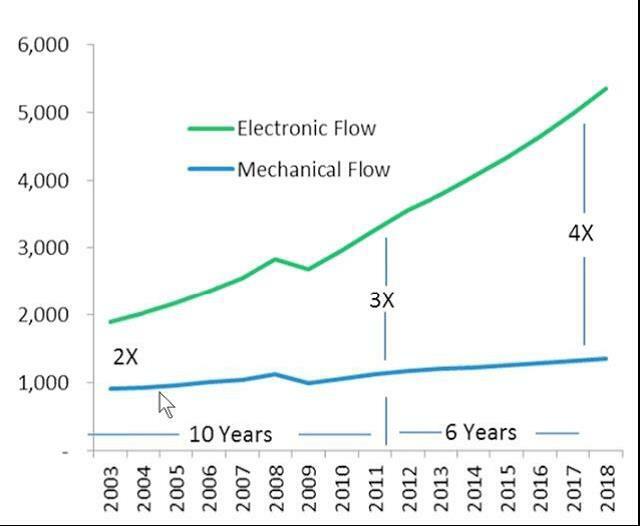 One could extrapolate that the differential would be 5 times in 3.6 years thereafter (2021) but the researchers believe that is unlikely because mechanical meters remain competitive in a number of applications—including custody transfer and fuel metering—as well as because of the inherently conservative nature of the marketplace which tends to support the use of well-proven technologies such as mechanical level instrumentation. In looking at the worldwide market potential, the MCAA report notes that lower spending in China, India and Brazil has pulled down the PI&A worldwide forecast through 2018 to approximately 4.5% CAGR with an addition of $10.1B added to the worldwide market total. This report is available to all MCAA members for no cost. For Non-members the cost of $2,500 can be applied toward dues should a company decide to join within three months after purchasing the report. MCAA exists to help the management teams of process and factory automation product and solution providers run and grow successful businesses by offering timely, unique and highly specialized resources acquired from shared management benchmarks where proprietary company information is secure—with unique, industry-specific reports such as the Annual Market Forecast. For more information, visit measure.org.